Solvang Tree Nursery L.L.C. is a family owned and operated nursery dedicated to growing high quality landscape trees, established in 1998. 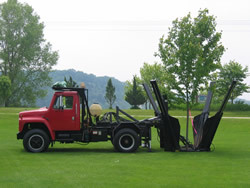 We sell and install larger landscape Shade, Ornamental & Evergreen trees to the Madison and surrounding Dane county areas. Our nursery stock has been locally grown and acclimated to Wisconsin, which helps your plants survival chances once it arrives to its new location. Our plant stock is also grown in some of the finest native clay loam soils to assure strong and healthy root ball growth and great soil nutrient. At Solvang Tree Nursery L.L.C., some of our trees are 12+ years old. This means we have some plants as tall as 20’ already. Looking for instant shade or privacy? We’ve got it. Solvang Tree Nursery L.L.C is open to the public and has acres of trees on display. We encourage visitors to share in all that the nursery has to offer & while on the grounds, they are encouraged to take pictures, make notes & meet with staff. Open: Mon. – Fri. by appointment 8 a.m. to 5 p.m. Sat. Walk-ins welcome 9 a.m. to 3 p.m.